Allied Fence adheres to the highest possible standards in our industry. Offering both economy and heavy duty quality fencing for pressure treated wood, and using high grade material, our fences are not only aesthetically pleasing, but will last for many years. 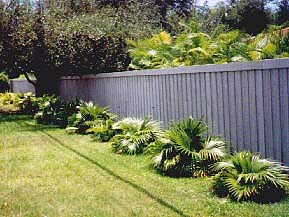 Our high-grade fencing can be stained or painted. Alternatively it can be left to weather naturally, without negative effect on its structural integrity. Providing security and establishing your property line, our fencing is also aesthetically pleasing and can add character to your back yard. Boards: pressure treated 1 x 6 nominal lumber all hand picked #1 to Allied specs. Rails: pressure treated ground contact hand picked #1 to Allied specs. Deck Screws: for rails and pickets with lifetime coating for Pressure Treated lumber. Black Decorative Post Tops: Keep water out of top of posts. Cement all posts: Lime in concrete will not affect pressure treated. Gates: 2” x 4” frame/bracing all around, 45 degree corners with 3 hinges on all gates. Grading of lumber: Allied purchases #1 and 2 and better and hand picks to Allied specs of #1. They mostly use ½” x 5” pickets which is a poor grade by Allied’s standard, 4x4 posts and rails #2,3 and 4 grades. They set posts 8 ft. apart mostly without concrete, except for Dade County. No caps on posts. Many use sections with 4x4 posts with 16d nails missing the posts a lot of the times, causing fence to blow down with a little wind. Allied will install one grade of PT. section, fairly high quality Board On Board ½” pickets 2”x4” rails still use concrete and Deck Screws to Post. Overlapping faceboards create a setting of maximum privacy. 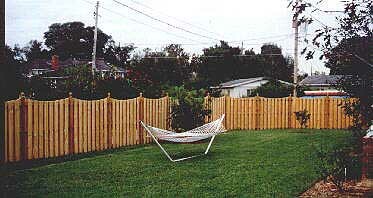 Two of the many styles of wood fence we offer are pictured below. To see more samples of our expert fence, deck and gate installations view our galleries. We have over 50 years in the business to ensure your satisfaction. To request a quote simply Click here and an Allied Fence representative will contact you.